There has always been a struggle for the inner soul of man. The first thing Satan did in Eden was attack the heart of Eve. He did not touch her. There was no coercion. The devil simply posed a question to the heart of Eve bringing doubt to the word of God. Battling for the heart has been the success of the devil. He knows that when he gains the heart, everything will follow. Controlling the spirit of man is how the evil one subdues righteous men to do his bidding. Filling the mind with ungodliness ensnares the whole man. The Pharisees and scribes were offended at the disciples of Jesus because they ate with unwashed hands. They challenged Jesus for allowing His disciples to disregard the tradition of the elders. Following His rebuke of the hypocrisy of the Jewish leaders, the Lord concludes with a short parable about defilement. The parable seemed vague to His disciples and they inquired to its meaning. Jesus explained it was not the matter of unwashed hands that would defile a man but rather the unwashed hearts that were defiled. Eating with dirty hands may not change the character of a person because this is only a biological act. The worse kind of filth is what is allowed to fill the heart and come forth in the actions of the person. Thirteen sinful acts of a defiled heart are listed by the Lord. Adultery does not come except from a heart that has filled the mind with lustful desires. Sexual immorality is not a moment’s reckless folly. It was a seed festering in the mind that allowed the act to happen. Murder comes from hearts that are filled with rage, jealousy and wrath. Cutting the hand off will not stop stealing because it is a matter of the heart. Wickedness is born from a heartfelt desire to do evil things. All of the sins listed by Jesus begin in the heart. We may speak harsh words and then apologize saying we did not mean to say what we did. The sad truth is we said what was in our heart. This can be a rash statement that we allowed unguarded to be said but what was said was in the heart. All these things come from within our own hearts. The solution is obvious. If the hands are dirty, they need washing. 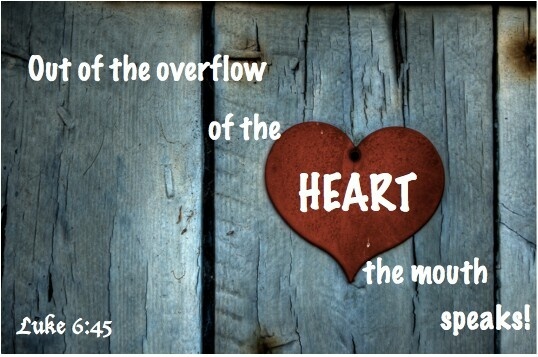 If the heart is filled with the filth of sin, it needs cleansing. This will be a lifelong struggle to bring the heart under the control of a loving God. The more we practice good habits of daily heart cleaning the less likely we will allow wrong things to come out of our hearts. Learning lessons when the tongue is used with unrighteous language or thoughts are measured by the wickedness we allow the eyes to see will help clean up our hearts. Road rage is common because the heart has been defiled with pride, arrogance and anger. Lust will grow into action if we do not check what we see on the internet. Evil thoughts come from thoughts that are evil. Prideful hearts defile a man. The word of God is the cleansing agent to remove the stains of sin. Scrub the mind with the Brillo pad of God’s word and there will be less things escaping the heart that defile.